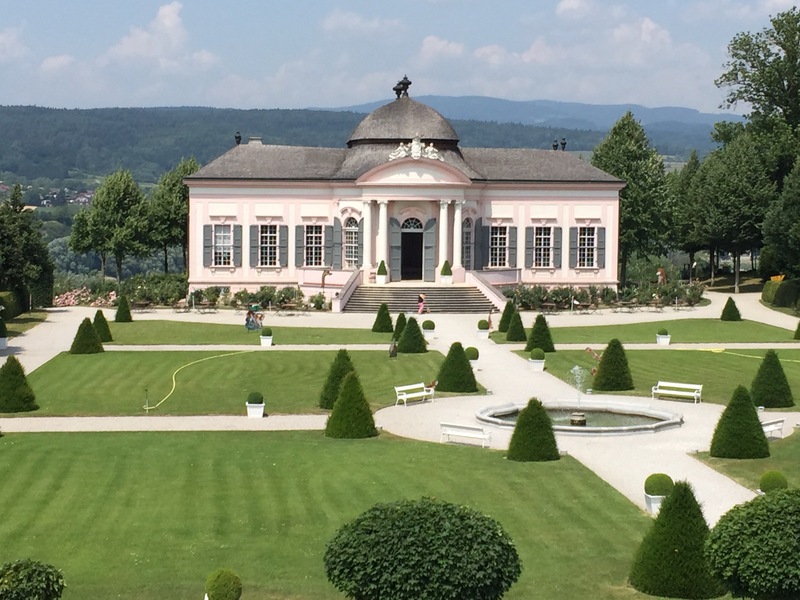 I extended my stay in the Austrian Wachau Valley where I am now exploring in and around the town of Melk an der Donau. 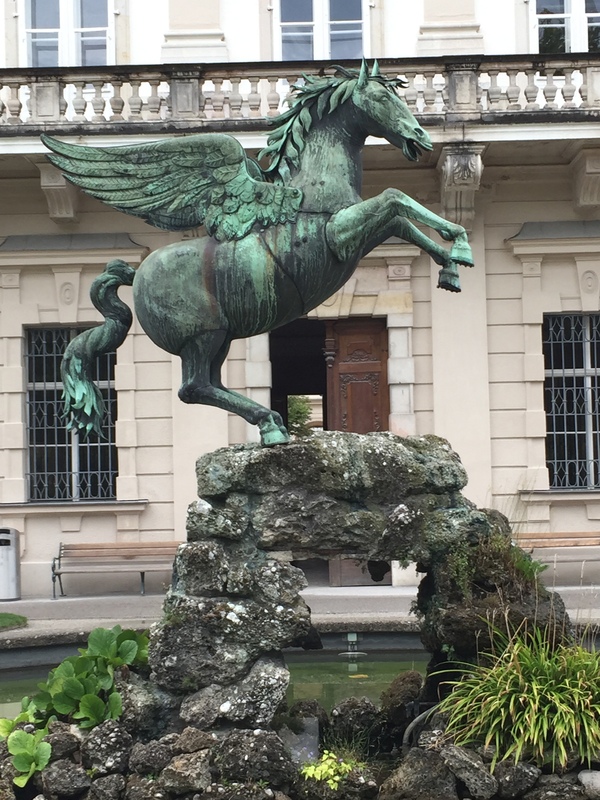 Melk is at the beginning of the gorgeous Wachau Valley with the Danube River running through it. The Wachau extends about 35 kilometers down river to Krems. Melk is a small community of about 5000 and is dominated by the picturesque 11th century Benedictine Monastery, Melk Abbey (German: Stift Melk). The Abbey is the principle tourist destination for the numerous Danube River cruise tours that tie-up here enroute from Amsterdam and elsewhere to Vienna, Budapest, and beyond. My apartment is in the older part of the town with the massive Abbey immediately behind me. 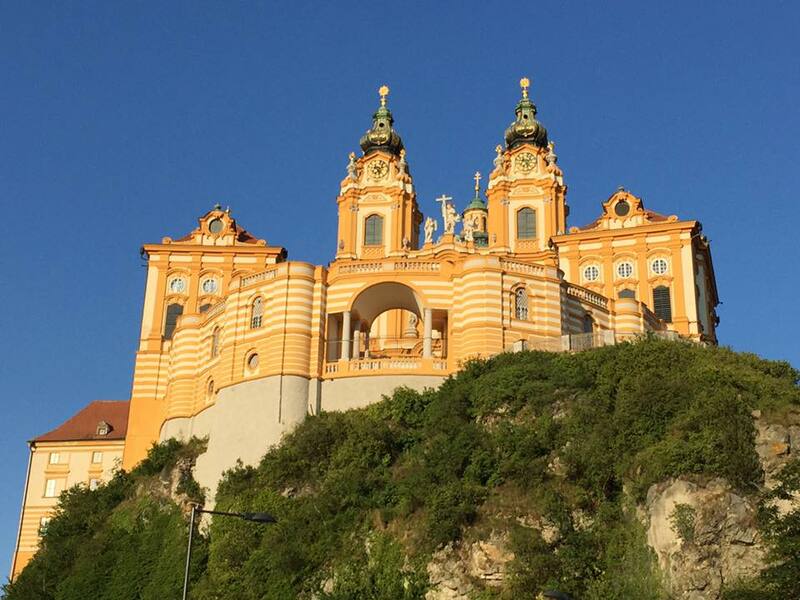 Overlooking the Danube, the Melk Abbey has a long history. It was founded in 1089. 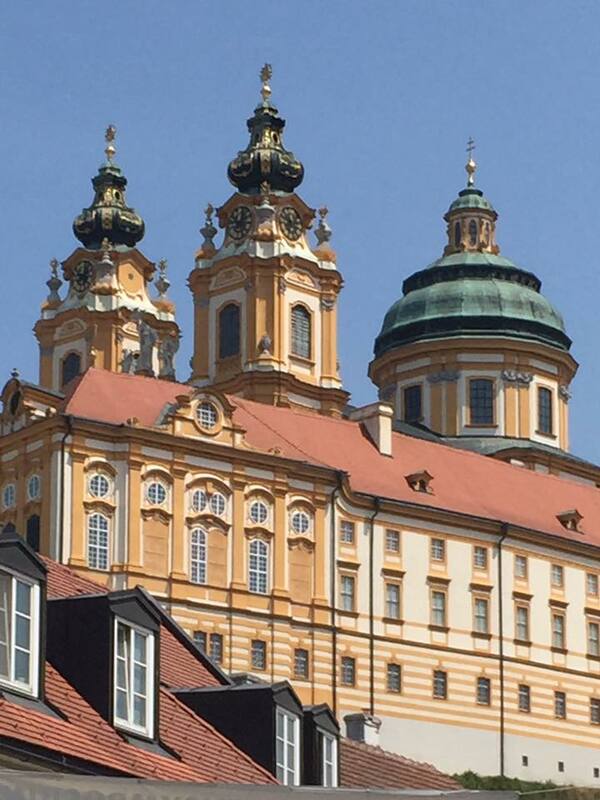 You can read more about the Abbey and the history of Melk here. For now, though, I am going to share with you some of my pictures and my observations. The town has a rich history and the town government provides numerous placards (in German and English) throughout Melk that provide the tourist with a great deal of information about the early inhabitants, their relationship to the Catholic church, the influence of the reformation, the first ruling dynasty in Austria, the impact of World War II, the buildings, the town growth, and the flooding of the Danube in recent times as well as the recording of the massive flooding in 1501. Melk is a chameleon. It takes on a typical tourist hot spot in the daytime as tourists flock to the Abbey. 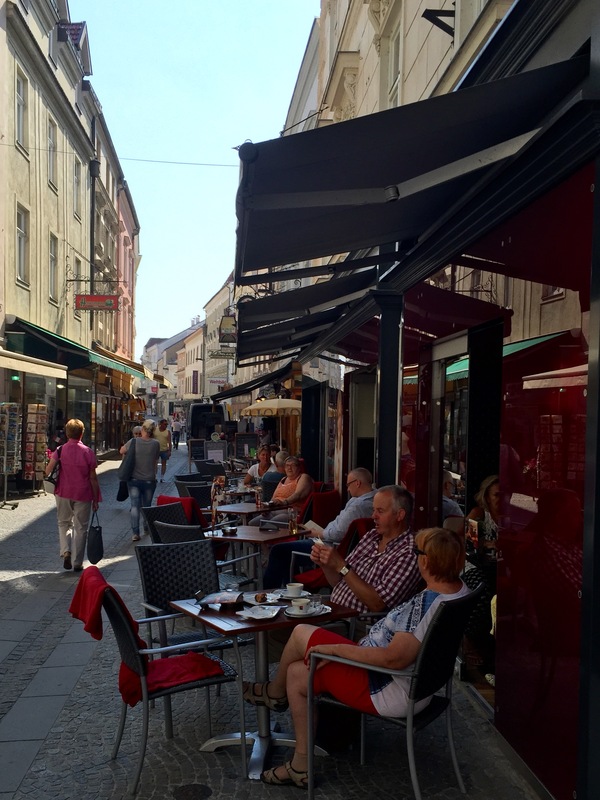 There are many places to have a coffee as well as a good wine and schnitzel. In the evenings, however, the tour groups from the river boats are mostly gone and those in town are residents and numerous bicycle riders who have stopped for the night. Weekly there are band concerts with participants in traditional Austrian dress playing music on the Rathausplatz. This is when the community just sits back and relaxes with a large beer-in-hand and listens to the music and occasionally sings along. Abbey tourists enjoy the massive old library, paintings of royalty and old world leaders, statues, and the beautiful artwork of the church interior. The Abbey is beautiful both on the interior as well as the exterior. 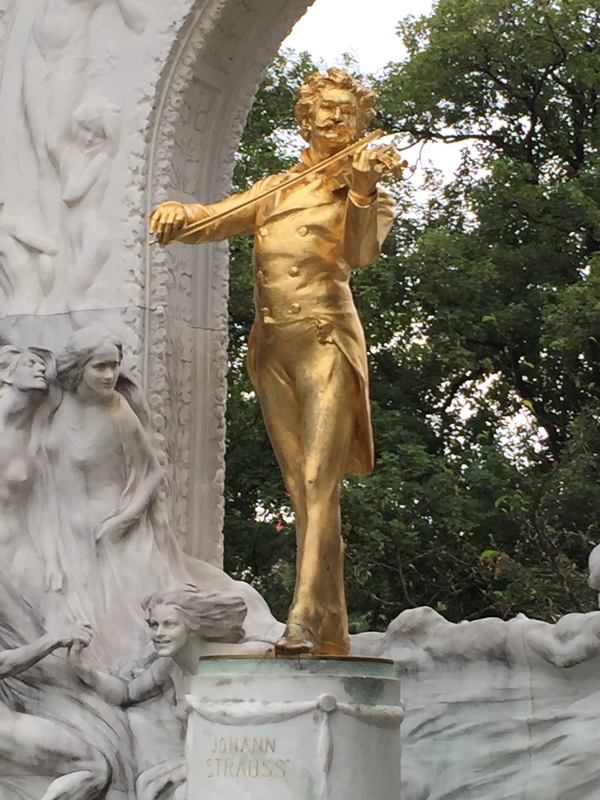 With a bit of luck you can hear musical rehearsals which in themselves are spectacular. But for me, the exterior gardens are quite special and a place that is often overlooked by the tourists who are visiting with very limited time to absorb the grandeur of the Abbey, the town and the area. 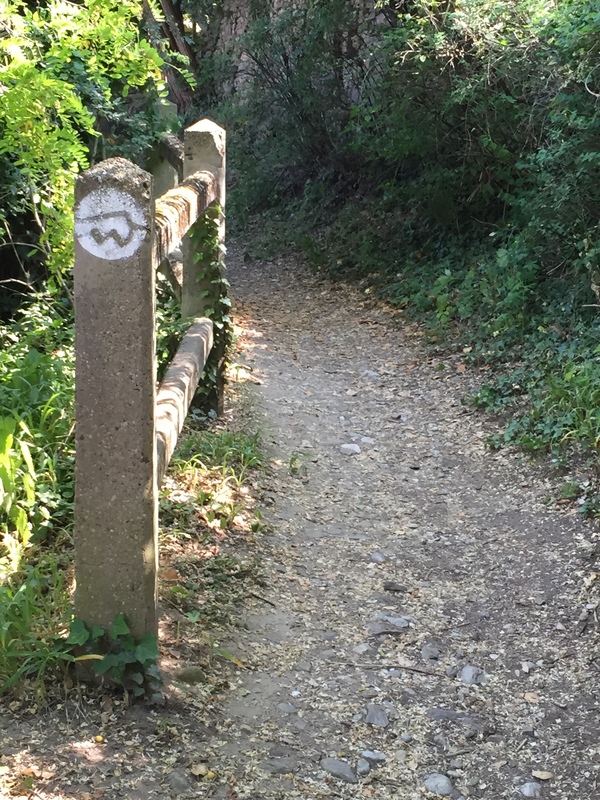 I have found the groomed walkways in the Abbey gardens to be nice but the peace and solitude found in the garden woods is very special. The smell of evergreens add to this place high over the Danube River flowing by. It is an ideal spot for me to contemplate, listen to nothing except for a few birds and the breeze in the trees. 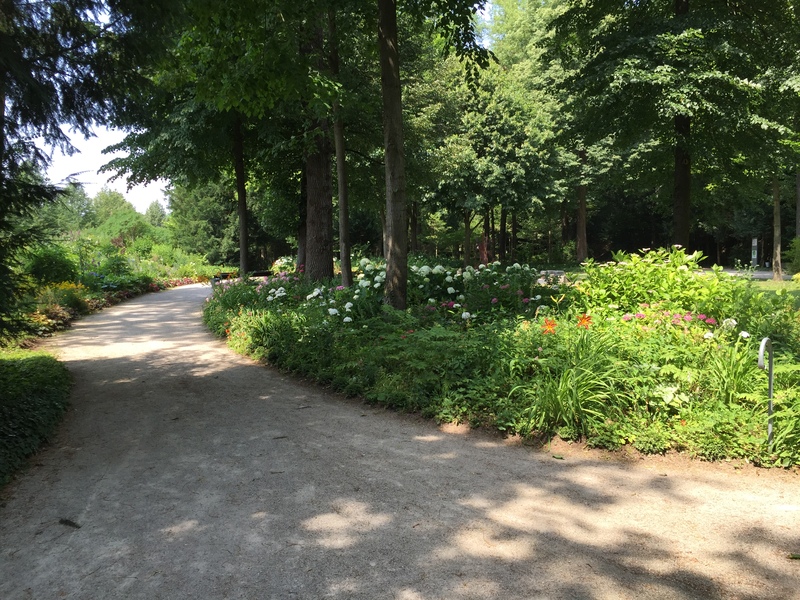 It is a great place to relax in the shade… my next destination. 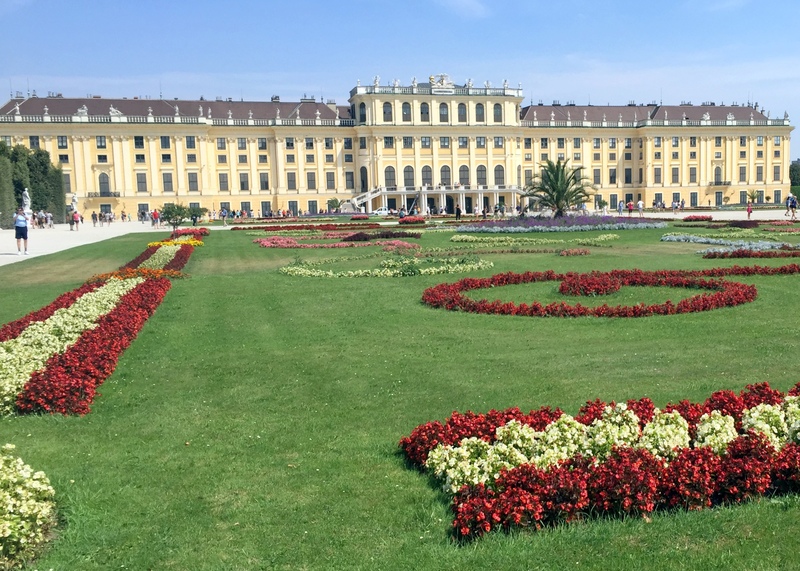 Lower Austria is a state in Austria where the Danube River flows through the country. 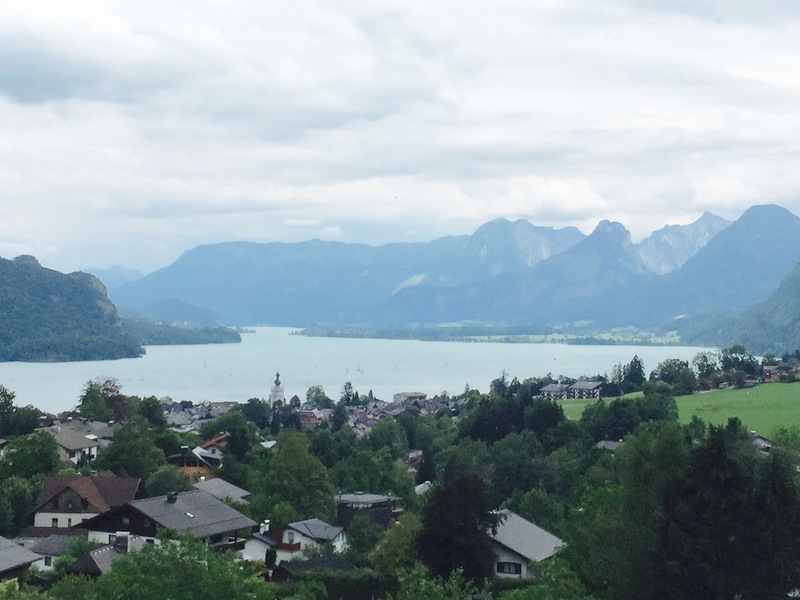 The state is in the northeastern part of Austria and is named “lower” to indicate elevation which is lower than in the mountainous regions of the country. 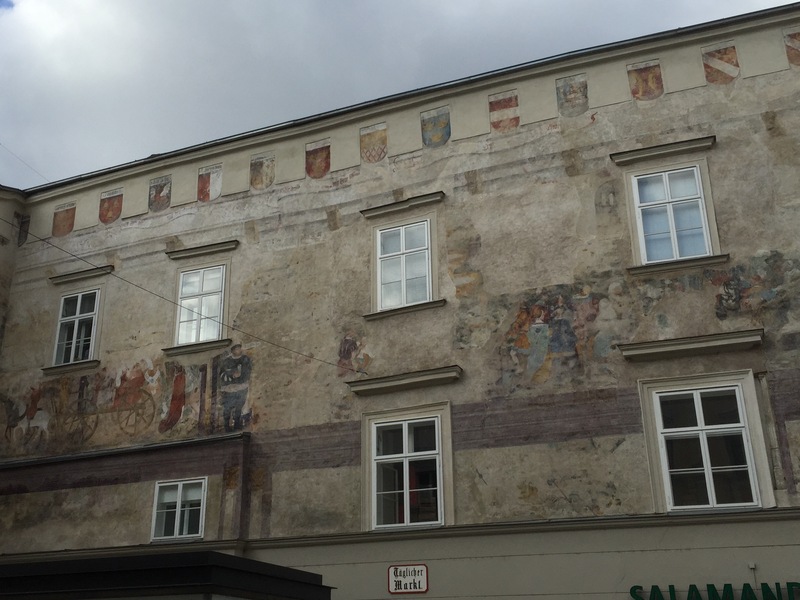 I am presently residing in Krems which is at the end of the Wachau Valley in Lower Austria and have previously documented the beauty of the region in other blog posts. In this entry I want to tell you more about the food and wine. Food and wine are very serious topics for which there is great pride in heritage, taste and visual effects. Principle meat products in the region come from pigs. Beef is extremely expensive. In addition, chicken is available but overall pork wins out as the primary dietary meat component. Roasted and smoked pork products are in huge demand and are sold in grocery stores, markets and are everywhere during festivals. Pork is on every menu and it appears to me to be in just about every lunch and dinner. I like eating the roast pork and schnitzel. 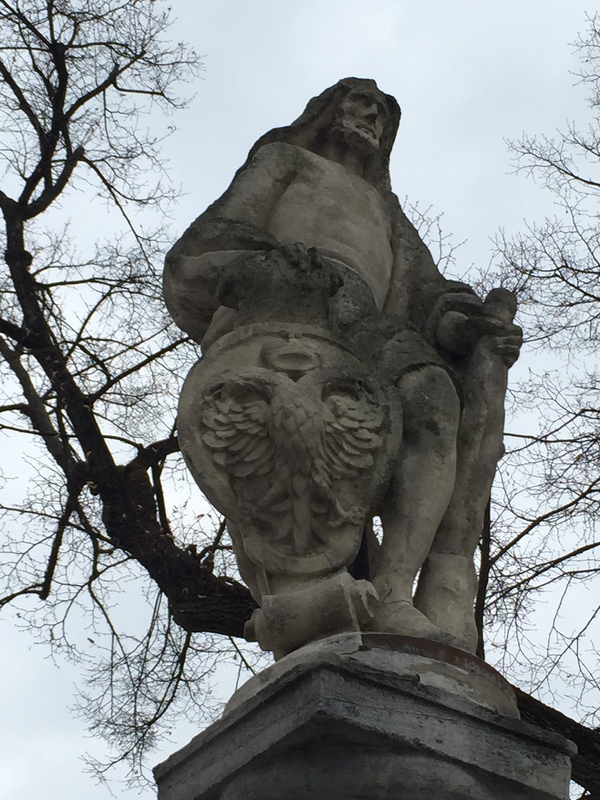 Wine is sacred in the Wachau Valley! 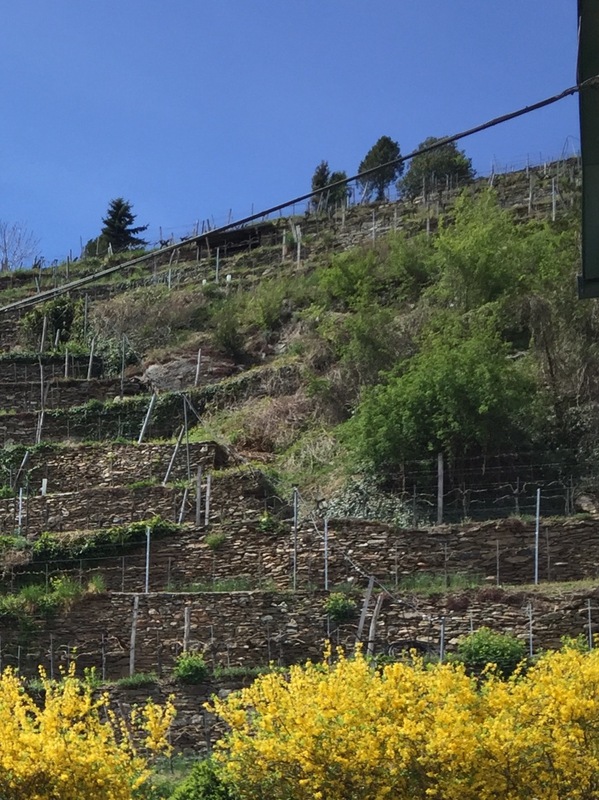 Vines are grown all along the Danube River in the terraced slopes on the hillside in the Wachau. 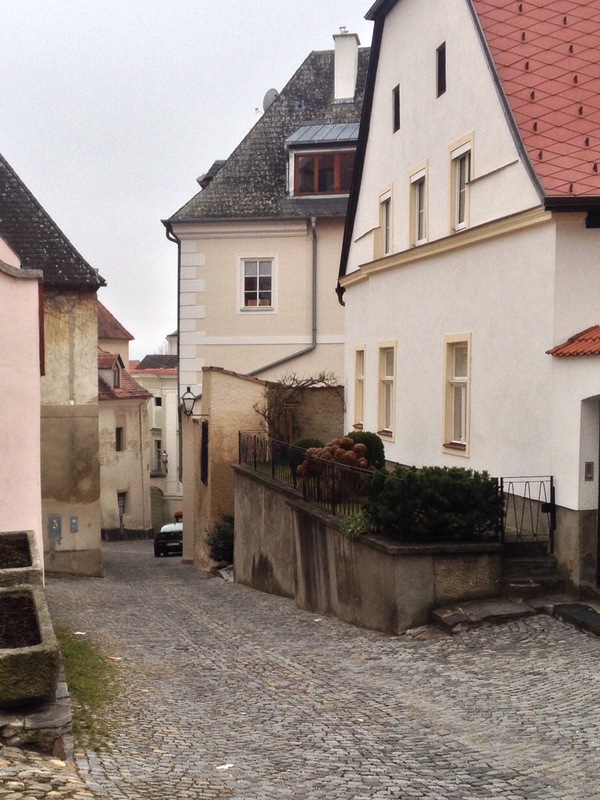 The stone terraced slopes (pictured) are traditional everywhere in the Wachau. 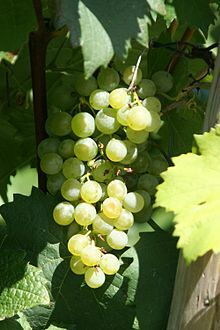 Gruener Veltliner (picture copyright Wikipedia) is the main grape grown here and makes up about 35% of Austria’s wine production. That is more than any other grape in the country. It dates back to Roman times and makes a dry white wine that white wine lovers enjoy… I personally prefer a red. 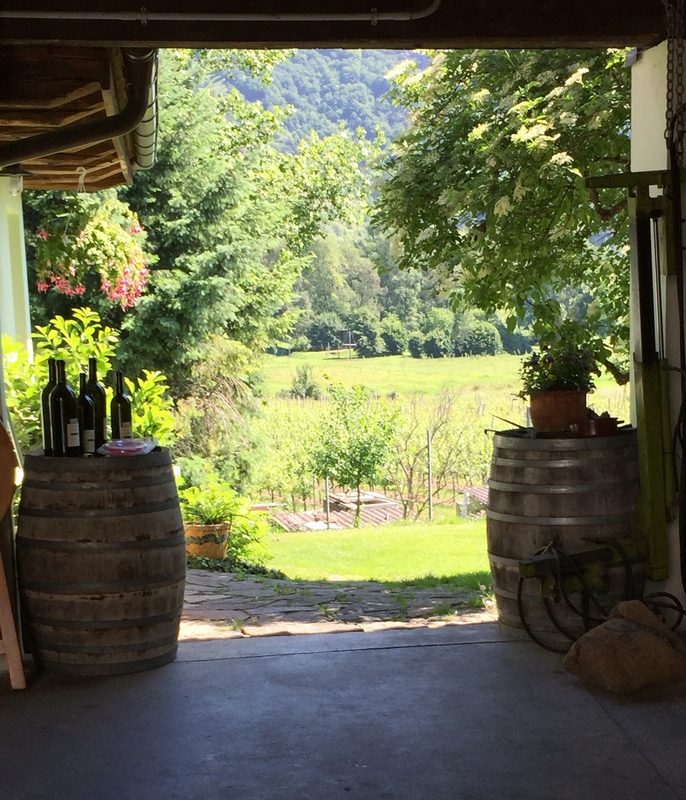 I have been on two winery tours since arriving in Austria and they were both very worthwhile. In the tours you obtain a sense of the wine production methods, quality control and how intensely important wine production is to the people who live in Lower Austria. Apricots (marilee) are another main crop in the Wachau Valley. They were introduced to the region before the Romans arrived, more than 2000 years ago. While wine grapes are mainly grown on the slopes of the left bank of the Danube, the largest apricot growing region comes from the right bank near Rossatz. The area orchards are often referred to as the “apricot mile.” So far, I have enjoyed the jam and liqueurs that are made from them. Soon, though, there will be an abundance of fresh apricots on sale everywhere here. I will be stuffing myself with them! 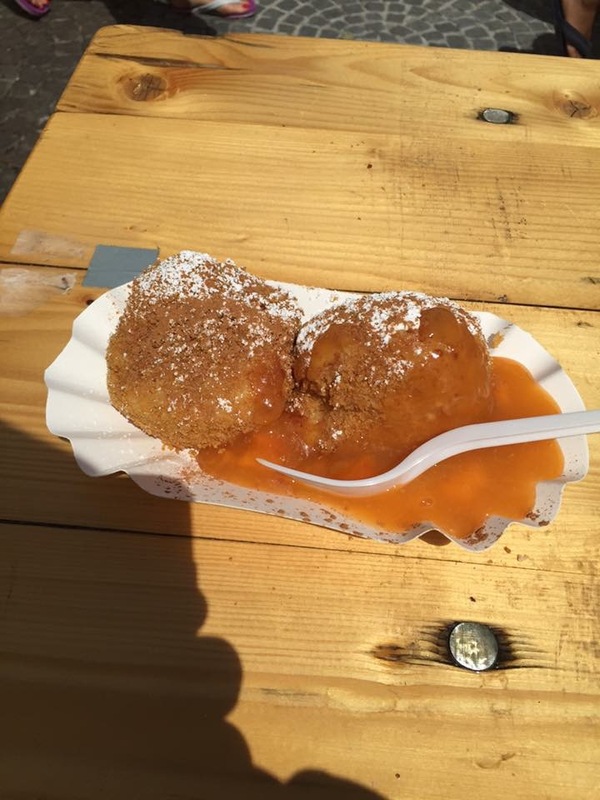 Just as wine is sacred to the residents of Lower Austria, apple strudel is sacred to me!!! Every restaurant and bakery has an abundance of sweet apple strudel, served warm and enhanced by vanilla sauce and / or real whipped cream. I enjoy the strudel any time of the day but especially at breakfast with a nice, aromatic coffee. Frankly, I haven’t found an apple strudel that I didn’t enjoy! That’s the update from Austria today. I hope you enjoyed my observations about local wine and foods! 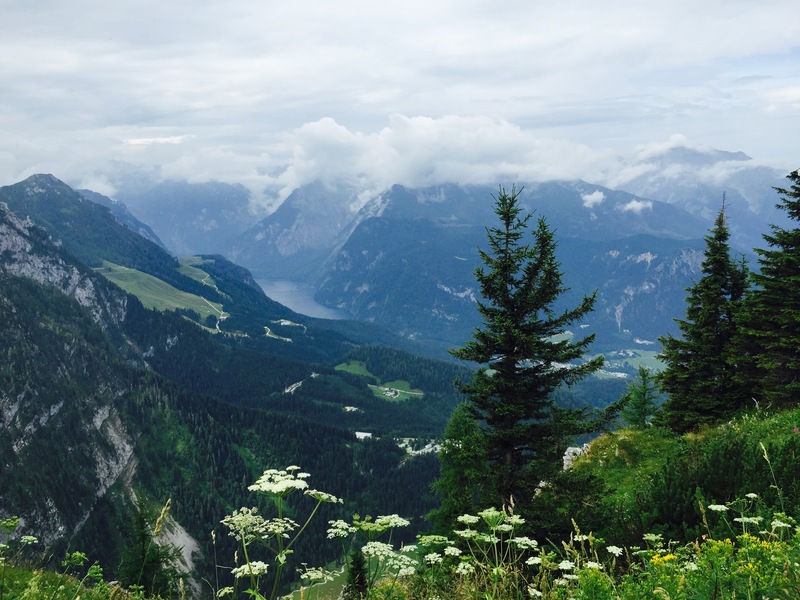 My travel adventures have taken me throughout the United States and every continent. I have fond memories of the terracotta soldiers in China, huge tortoises in the Galápagos, Uluru in Australia, penguins in Antarctica, going inside the Great Pyramid in Egypt, walking around Stonehenge in England, and many more! 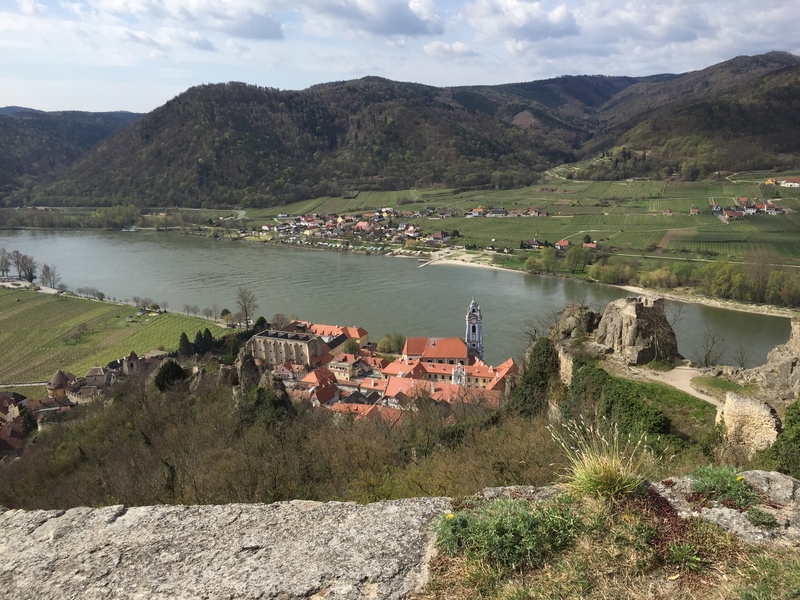 But I must say that the Wachau Valley in Austria with the Danube River flowing through it is certainly the most beautiful location I have ever visited. 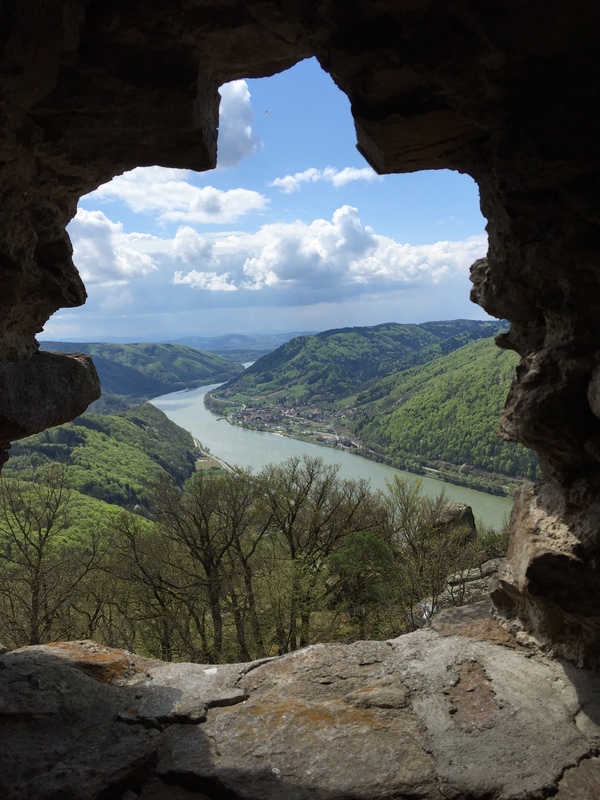 Yesterday, I journeyed to the heart of the Wachau Valley, reminiscent of complicated journeys of the past by tour boat, car ferry, hiking, and bus. The journey itself took plenty of time, particularly when I found myself on the wrong side of the Danube (thus the need for the ferry)! 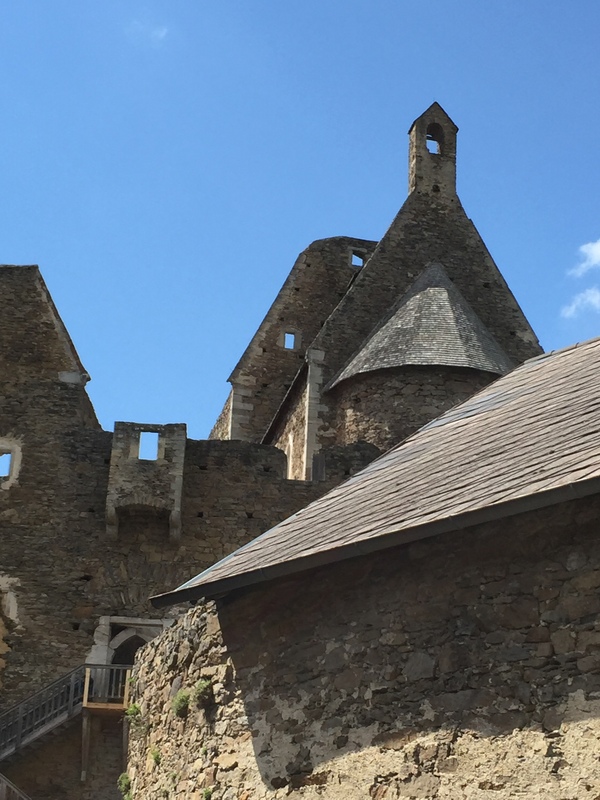 But my digression leads me to the heart of this blog when I visited Burgruine Aggstein, the castle ruin high atop a mountain overlooking the river. There is a fantastic aerial view of the castle by going to this link. There is a medieval event at the ruins at the moment. People are arriving in costumes and there are tents where people are selling food, drink, medieval-looking toys, jewelry and many other things. My goal was to tour the castle, which I accomplished. However, I also ate a hearty meal of roasted ham, grilled cabbage, and a dough ball that contained I know not what except for the horseradish that lingered through the night! It is believed that the castle was constructed in the 12th century on a natural rock formation. It is located approximately 300 meters above the river and has excellent views of the river in either direction. The strategic value was to excise bounty from the merchants as they moved their goods past this point by boat. For example, the castle dungeon held many until a handsome ransom would be paid! 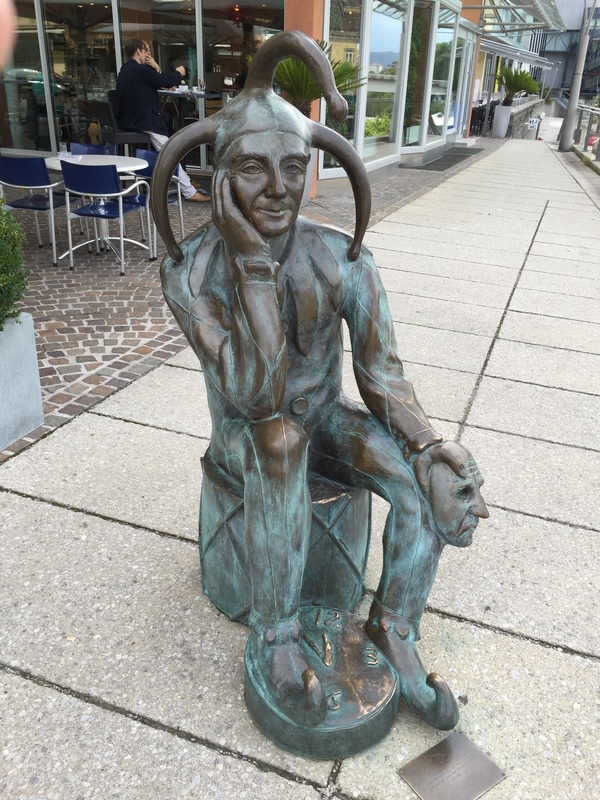 You can learn more about Aggstein by clicking this link. I have included a photo leading to the rose garden through the thick castle wall. Note the carved out steps worn smooth over the centuries. And also pictured is the rose garden itself. 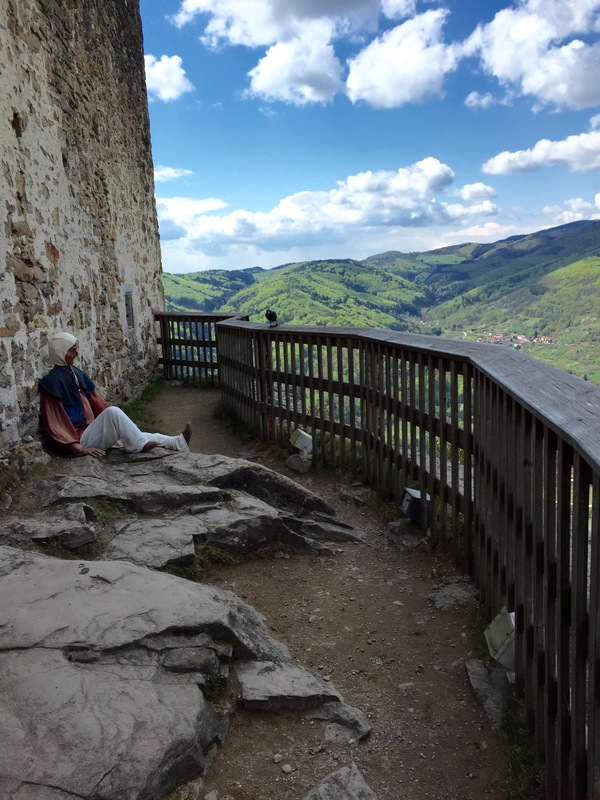 Many visit the Wachau Valley but river cruises may not stop at a place convenient to visit Burgruine Aggstein. This is really too bad. If you come to the area, this is one place to not miss. 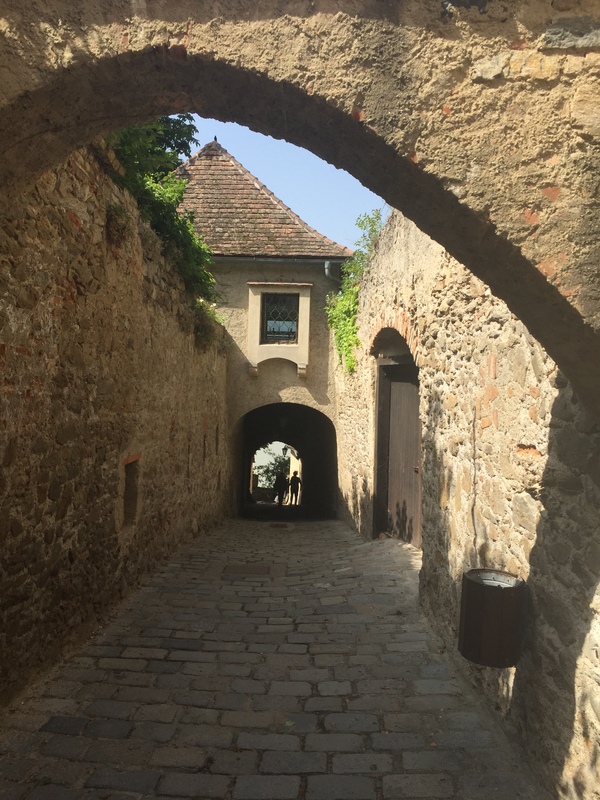 The past few days as I roamed through parts of the Wachau Trail in Austria, I came to realize that I am taken not only by the beauty of the buildings and ruins but also by their simplicity and unique architectural lines. 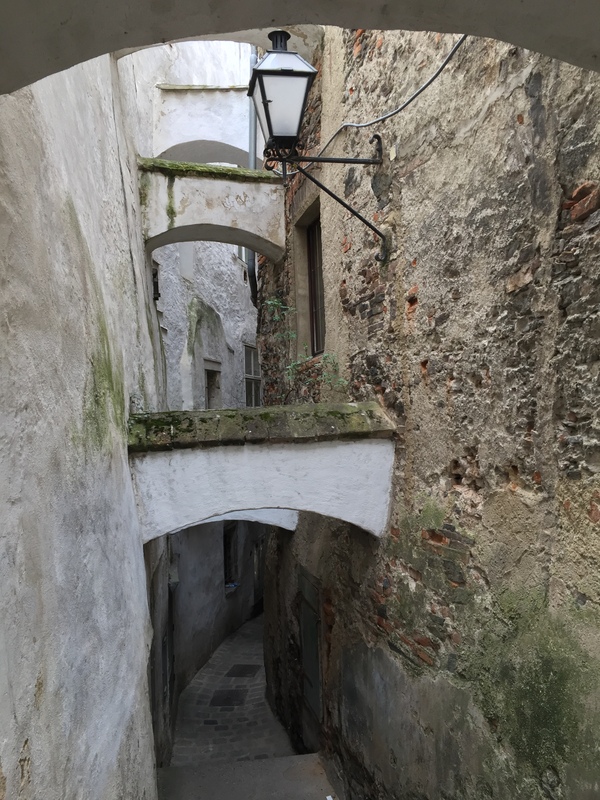 As I see these buildings with lines that are not straight, have bulges, and often lack symmetry, I understand that I am finding them to be very beautiful. 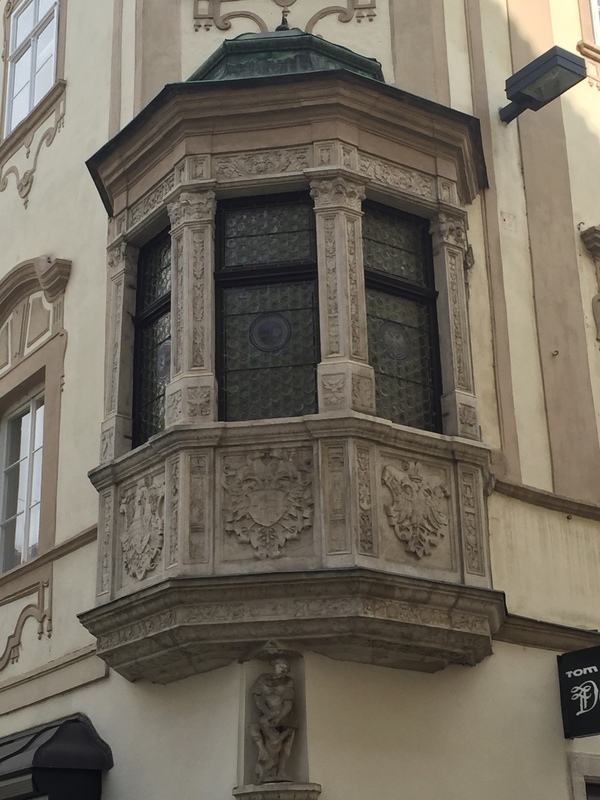 I look at the craftmanship that has gone into the buildings and see works of art. 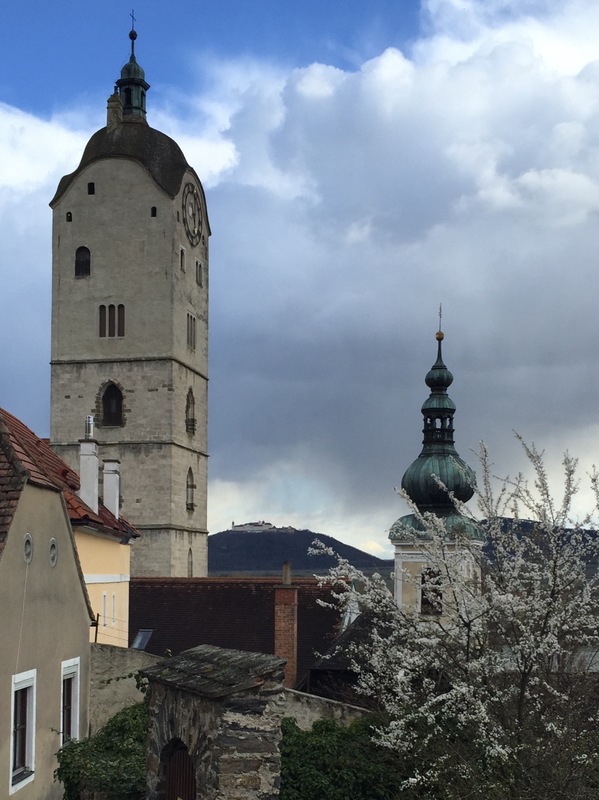 For example, today I enclose two photos taken in Durnstein and Krems. 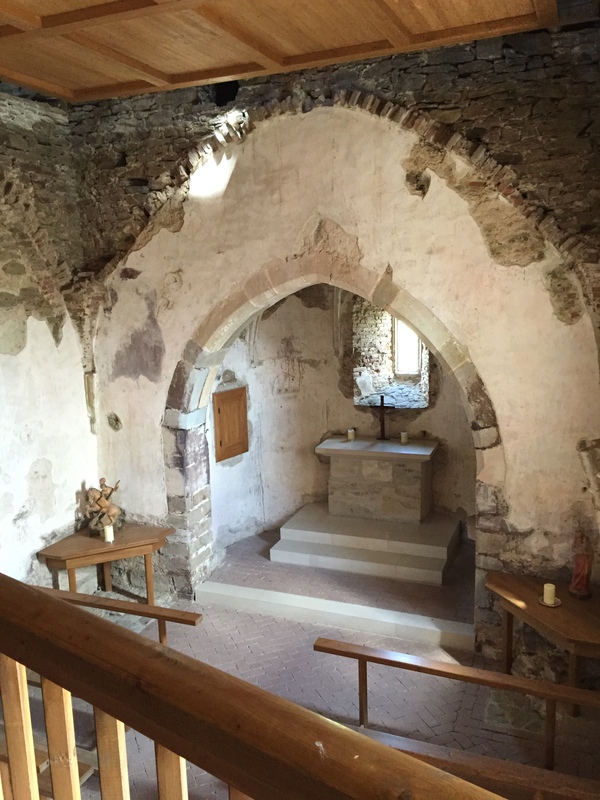 One is of a Krems house that was built in 1210 and the other is ruins from the Durnstein Castle built in the twelfth century. 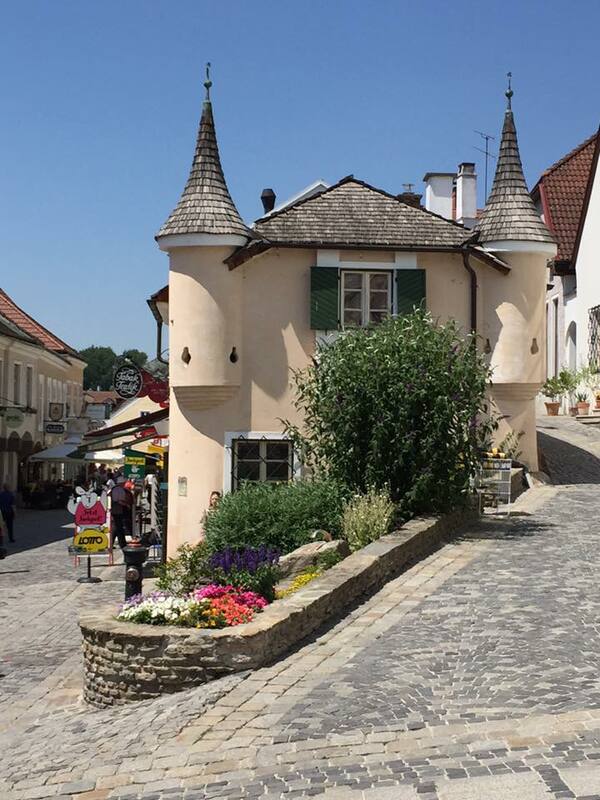 Notice the lack of symmetry in the house and imagine the castle ruins taking structural shape based on the rocks high in the mountain overlooking the Danube River. 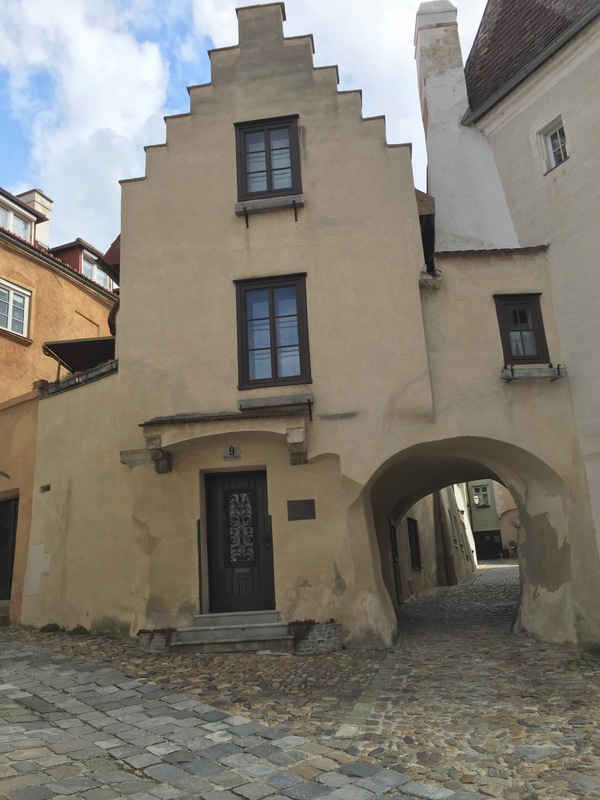 Of course there are architecture representations where engineers of the day constructed buildings that have almost perfect lines, like the Steiner Tor built in the fifteenth century. This photograph isn’t mine as I just can’t seem to capture it well. 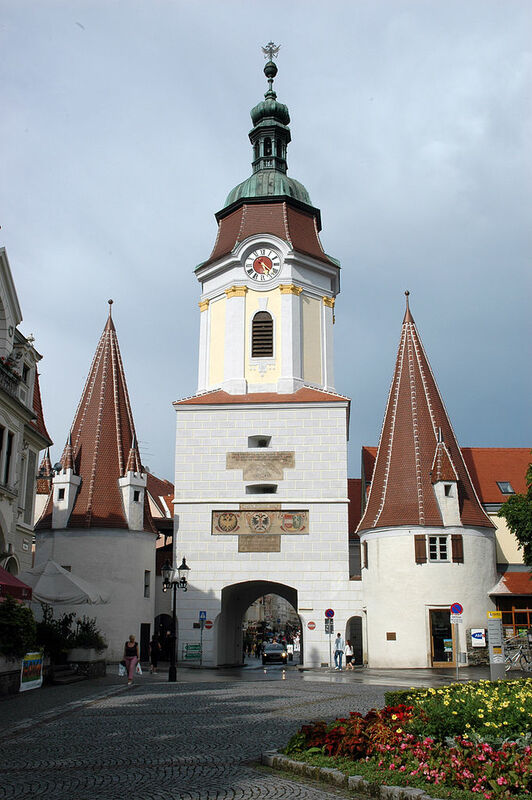 But it is beautiful at the western entrance to old Krems. 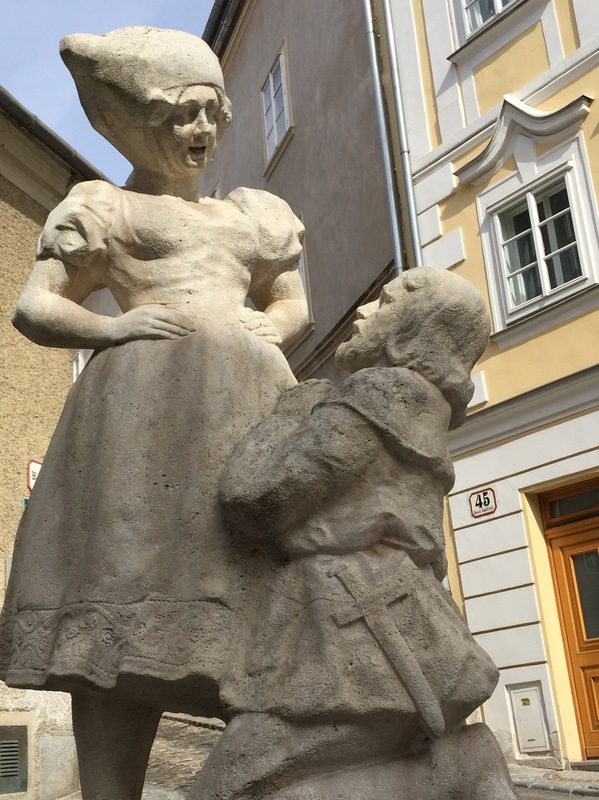 There are numerous statues in Krems many of which are depictions of religious figures. 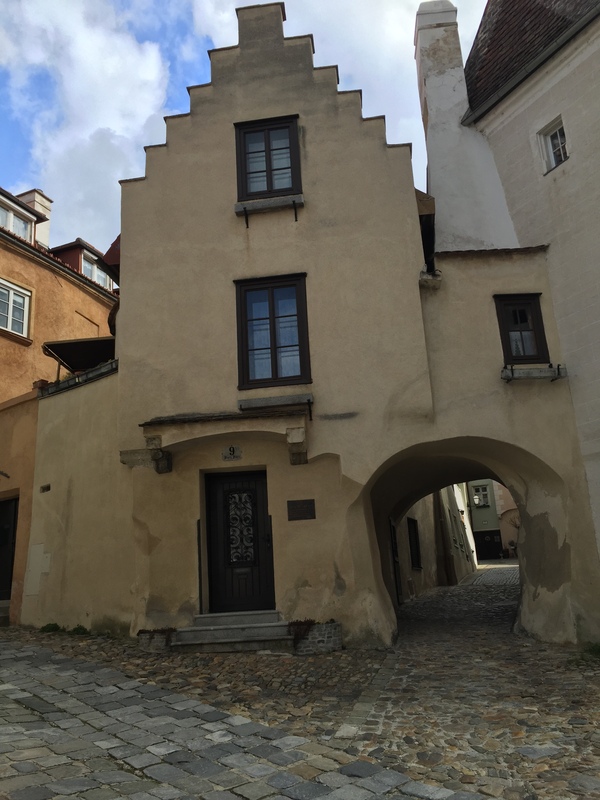 One that I have not yet learned about was constructed in 1682. It appears to me to be an old knight, possibly from the crusades. Crusaders traveled this way. Signs of Spring are everywhere now! The apricot trees are in bloom and soon the millions of grape vines will be growing again on the Wachau Valley slopes on both sides of the Danube River. 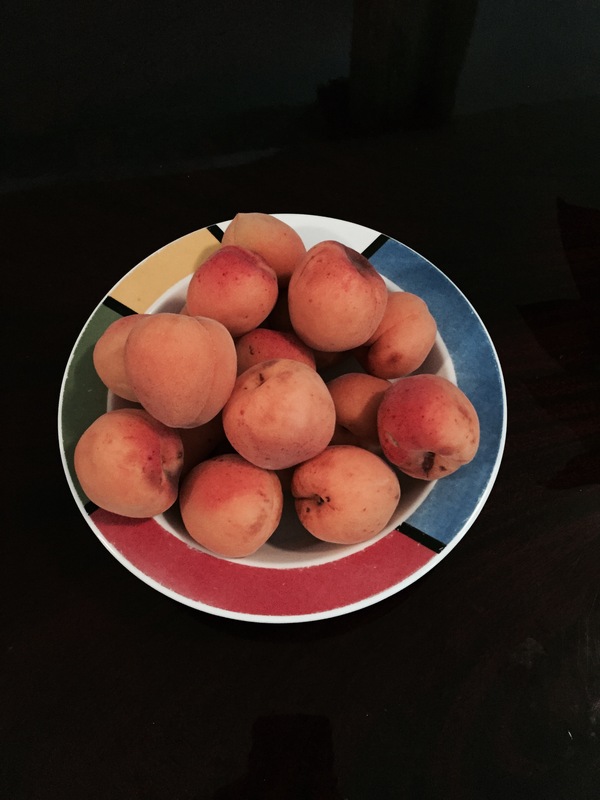 Both apricots and wine are specialty products in this area and I am looking forward to enjoying them throughout the Spring and Summer. 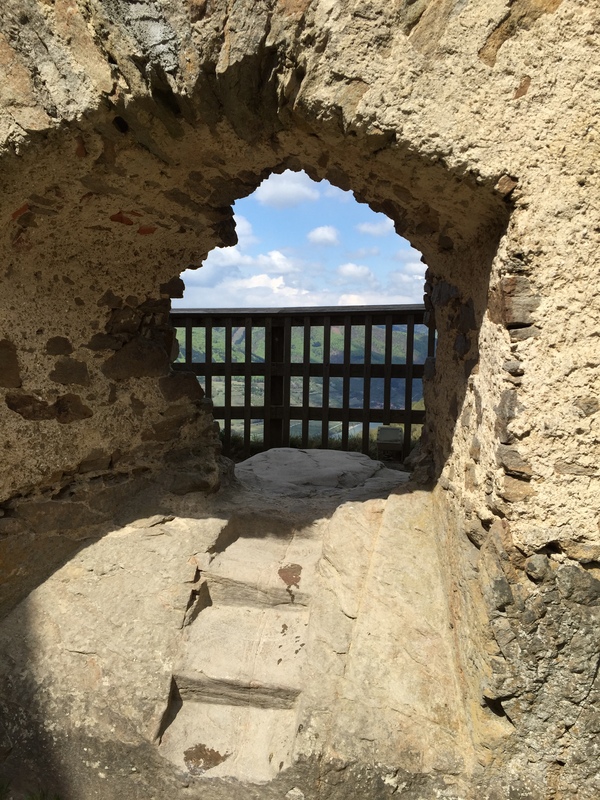 One last photo for today is taken from the castle ruins in Durnstein. King Richard I of England was imprisoned here in 1191 on returning from the crusades. 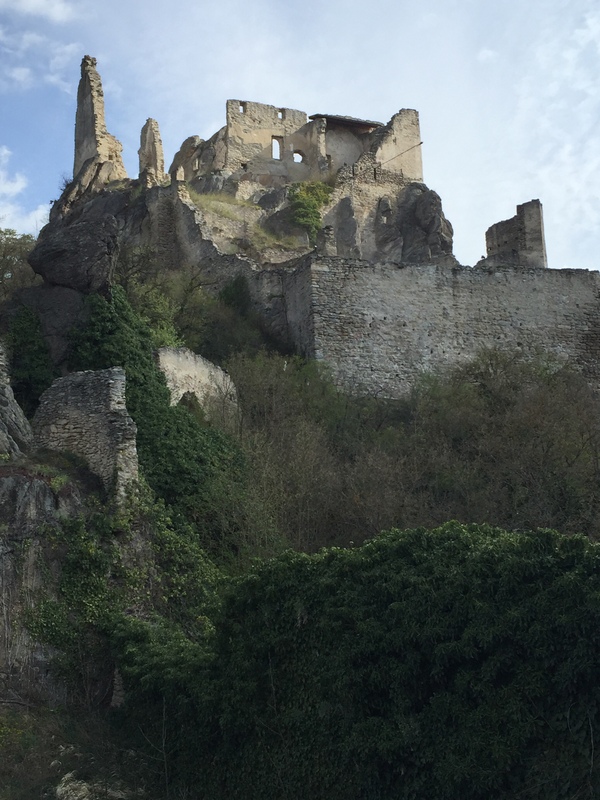 The castle overlooks the river valley below, the town of Durnstein, and the numerous vineyards. 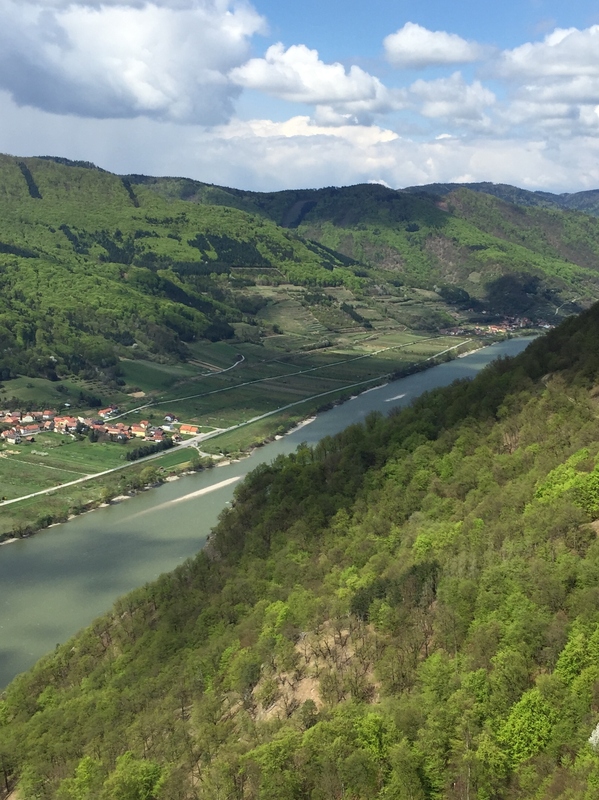 The Wachau Valley is a very beautiful place!